Posted by Bravado Cooking for Men in Classic Italian Dishes, Cooking and Wooing, Recipes. This is my favorite romantic recipe in the whole world, and it is relatively simple. If this dish doesn’t do the trick, either that special person has lost all taste buds and olfactory senses, or you have made a colossal mistake in thinking that this person likes you in any way. 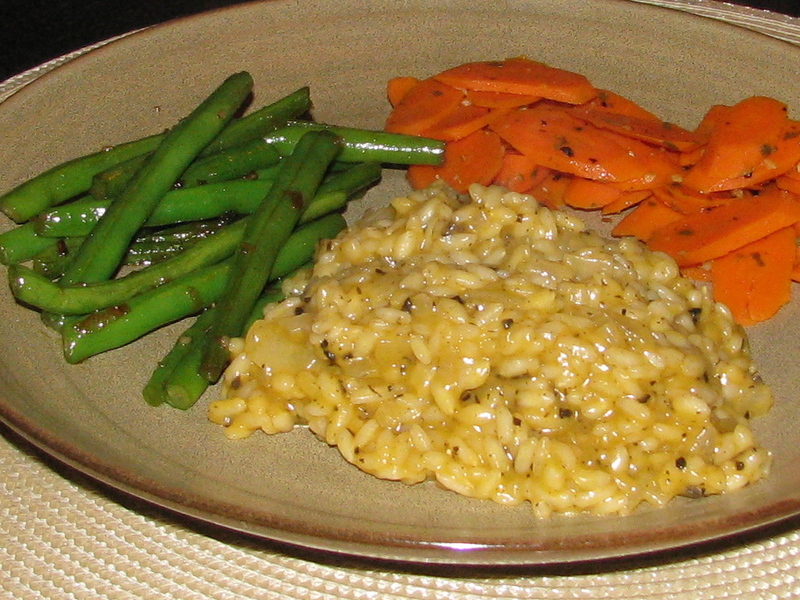 Risotto is a great dish for the Bravado chef. It takes about 15 minutes of prep time and 45 minutes to cook. During the cooking, you need to be constantly stirring the rice. Since stirring is generally a one-handed activity, the other hand is free to hold a wine glass. One of our great Bravado chefs, Pris Nei, once said that a glass of wine was a requirement when making risotto. Your partner can easily help with the stirring and you can give instructions on the proper stirring method – making imaginary figure eights in the pan. 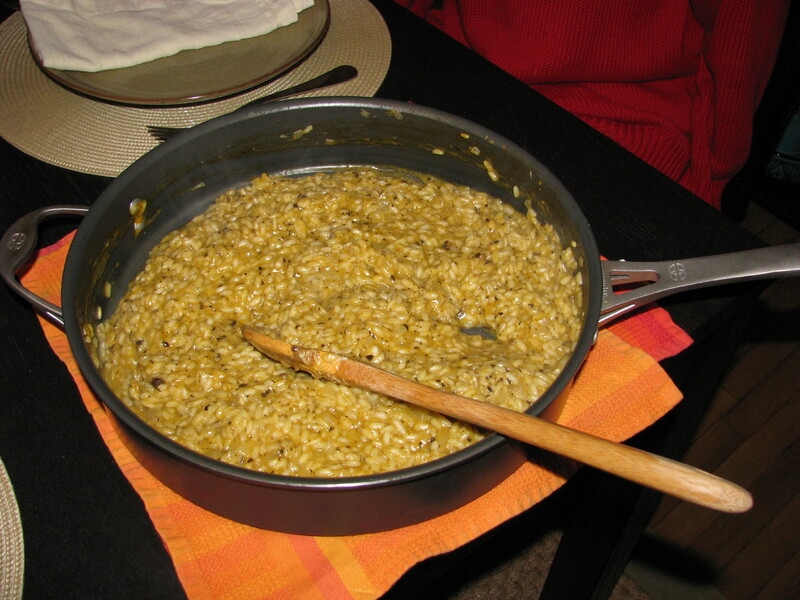 You can use three varieties of rice to make risotto: Arborio, Carnaroli or Vialone. These are primarily grown in Italy where they originated, although there are now some growers in the U.S that produce the Arborio variety. In Italy, there are four grades or qualities of these rices: Originario Comune, Semifino, Fino and Superfino. There is a definite difference and if you can find a “Superfino”, you are in for a taste treat. All of these varieties exude a creamy, starchy material after cooking for about 30 minutes. That creamy texture is the main claim to fame. However, they also stick to the pot very easily, thus the need for constant stirring. You get best results if you add the liquid a little at a time until absorbed. Continue stirring and adding liquid until you see the creamy texture and the grains are still a little crunchy in the middle. While it sounds like a bad ingredient choice, the end result makes it worth the work. Showtime Stats: Italy was one of the main producers of rice in Europe at the time of American independence. Thomas Jefferson, both a politician and a farmer, used his time in Europe while ambassador to France to travel to Italy and obtain seed from some of the best rice varieties. “Obtain” may be a euphemism, since the seed was highly protected and Jefferson may actually have been guilty of smuggling the seed back to the U.S.
As you can see in the recipe below, the truffle sauce is added at the very end. In the instant that the sauce hits the hot, creamy rice, an intoxicating aroma, unlike anything you have ever experienced, will explode in your senses. Both you and your partner will, at that very instant, lean over the bowl, breathe deeply and approach Nirvana. The risotto is almost a meal in itself, but you should also serve one of the vegetable dishes you have prepared earlier in the book. The “Asparagus in Brown Butter and Thyme” is a great choice as are sautéed carrots. You should make these ahead of time and warm them up as you complete the risotto. In my mind, the correct wine is a Sancerre or a good Sauvignon Blanc. Use the wine you drink in the recipe itself. Don’t complicate your life with dessert – more important things may be on the agenda, so simply clear the dishes and finish your wine. Wine Facts: Sancerre is a brilliant white wine from the Loire valley in France, southwest of Paris. It is a truly romantic part of the planet filled with beautiful castles. The wine is named after the village of Sancerre but is made in 15 other nearby towns and villages. The grape is Sauvignon Blanc, but, as we know, the French never use the grape varietal to describe a wine. They only use a geographic reference – usually a town or village name. This reflects their conviction that the “terroir” or the characteristics of a specific piece of earth is as much responsible for the wine as the type of grape. Heat the chicken broth to a slight simmer. If you are using your homemade frozen chicken broth cubes, you need to let them defrost ahead of time in the pot. Heat the oil in a large sauté pan and then add the onion. Cook until translucent. Add the rice and toast for about three minutes, stirring frequently with a wooden spoon. Add the wine and begin stirring in a figure eight motion. When all of the wine has been absorbed, begin adding the heated chicken broth, one-half cup at a time. Use you measuring cup to dip the broth. As soon as, the liquid is absorbed and you see a dry path along the bottom of the pan, add another one-half cup of broth. Keep adding broth until the rice is creamy and “al dente”. Have your partner test a grain. When the rice is done, take it off the heat, and stir in the Parmesan and the butter. Then add the truffle sauce and stir well while enjoying the aroma with your partner. Take the sauté pan to the table and serve at once. You will have already put the asparagus and carrots on the table. This recipe will certainly get you interested in risotto. There are hundreds of varieties of this great dish. Basically, you can put anything in risotto and experiment all you want. 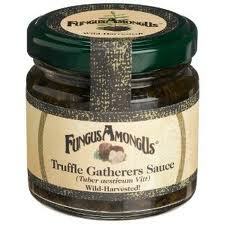 You follow the same recipe as above but substitute other ingredients for the truffle sauce (e.g. asparagus, shelled sugar peas, seafood or mushrooms). Some ingredients require some cooking ahead of time, others can be added halfway through the risotto process, but you can figure that out. A true Bravado chef has his own “special risotto”, although I doubt any will be as romantic as this recipe with truffle sauce.